I think there is a shoe category that fashionista’s have been overlooking for a long time. I would have laughed in your face 5 years ago if you told me sneakers could be fashionable; much less sporty ones. I’ve always been an advocate for Vans and Converse with a casual outfit. But I’m talking a whole new level here. Sneakers with pencil skirts, dresses or cropped pants. This look can work all through out the year. Pair sneakers with your skirts or shorts in the Spring/Summer. In the winter pair them with leather leggings or a long pea coat. 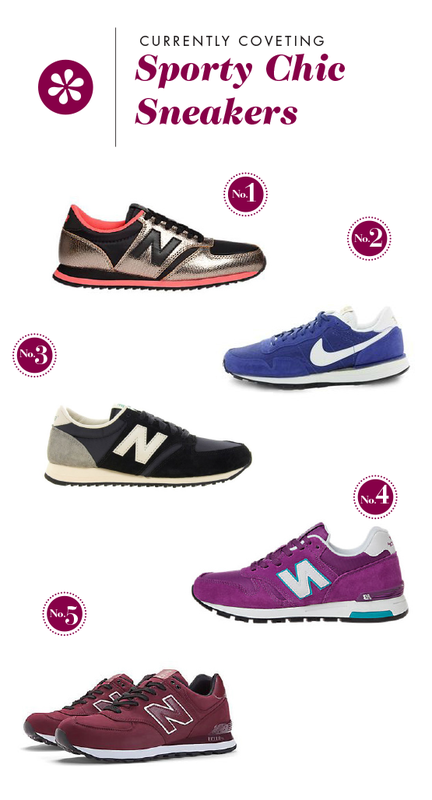 When it comes to this category, New Balance has caught my attention with their personalized casual kicks. You get to pick anything from the fabric, stitching, logo all the way down to the lace color. I recently ordered this pair for only $50! I can’t wait to start styling this piece into a few outfit posts. Here’s a little styling inspiration for you: 1. 2. 3. 4. 5. Reasons to add these puppies to your wardrobe: 1. They will be warm in the Winter vs. canvas Converse or Vans 2. Maintain a chic look without compromise comfort 3. Easily create an unexpected twist to a seemingly fancy look 4. Use your sneakers to add a loud pop of color to an all black Winter look We know bloggers like Sincerely Jules and Style Scrap Book rock this look hard. What about you, would you add this into your wardrobe? Still not convinced, check out my pinterest board for more ways to style these puppies. I’ve also hunted high and low on the inter webs. Next time your thinking about slipping on wedges, flats or high heels with your dress or skirt, stop and consider adding a sneaker for a fresh twist to an everyday look. 1. 2. 3. 4. 5. *Note this post is not sponsored by New Balance, I’m just mildly obsessed at the moment. Great post- tis the season for holiday eating and I’ve been looking for a chic pair of sneakers to take with me to work. Get some cardio in on lunch and so far haven’t found anything that doesn’t look ridic with a pencil skirt or trousers….. I’ll have to try these!